The journey to Easter is exhausting. A lot has happened since last Sunday. Seven days that seem like seven ages, each pulling on our emotions as we recall the events that led up to the crucifixion of our Lord on Friday. And mixed in it all is another terrorist attack, this one in Brussels. And that was just one set of attacks. There were terrorist attacks in the Congo, Iraq, Syria, the West Bank, the Philippians, Afghanistan, Mali, Yemen, Burundi, Turkey and Somalia. Then they remembered… I love that line. The women remembered. Perhaps we, too, will remember. And when we do, rejoice. Death and the grave is not the final word. Those of you who attended my lecture, “About the Funeral” heard this story, but I’m going to tell part of it again. My first encounter with death was that of my great-grandma McKenzie. I was seven years old and we were living at the time in Petersburg, Virginia. My great-grandma lived on land that had been in the McKenzie family since the middle of the 18th Century. She had a stroke in the out in the garden. My great-grandfather was with her and he had to run to call for help-there were no cell phones in rural Moore County in those days, only party lines. The help that came was too late. The next day, kind of like the women in our story, we made our preparations and headed out early for the trip to North Carolina. My great-grandma is to the left. I’m being held by my great-grandfather. Beside him is my father and grandmother. 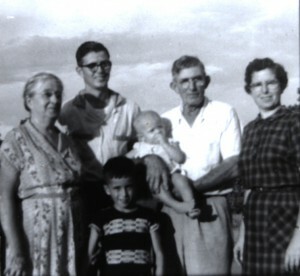 The other child in the front is my uncle, Larry. That evening we went to the funeral home in Carthage, the county seat for Moore County. It was a big old house that looked haunted. It was a hot humid summer evening. Out in the yard there were men dressed up, having forgone the overalls of the tobacco fields. They were all clean and dressed in dark pants, white shirts and narrow ties with a tie clip. They clustered in groups of two or four, smoking and talking. Women were sitting on the porch that wrapped around the home. Mom and dad ushered us up the steps and inside to a dimly lighted room. My great-grandfather was sitting there with tears in his eyes beside the casket contained the remains of my great-grandmother, his wife for nearly sixty years. As my father talked to his granddad, my mother ushered us kids up to the casket. She looked like great-grandma, but then she didn’t. She was dead. Mom then did something that I’ll never forget and it was a wonderful gift. She pointed out my great-grandma’s hands. They were wrinkled and there were liver spots. The only jewelry was a small wedding band on her ring finger. Mom asked, “I wonder how many apples those hands peeled? Do you remember her apple pies?” Of course we remembered her pies, baked in Jugtown pottery. That question drew my focus from the lifeless body of my great-grandmother and caused me to remember. We had lived next to my great-grandparents on Dobb’s Chapel Road before moving from Moore County to Virginia a year and a half earlier. I had fond memories of running through the woods over to their home and being warned not to stray off the path as my great-grandfather had beehives between the path and the road. I had seen my great-grandfather harvest honey, wearing a suit that covered his body with a screen over his head and a can that produced smoke to flush the bees while stealing their honey. Although he was no longer actively farming, they still raised much of their food. There were gardens and chickens, along with apple and pecan trees around the homestead. Once, I remember helping my great-grandfather gather the wood he’s split and take inside for the wood burning range in the kitchen. My great-grandma had two stoves in the kitchen: a wood burning stove and a gas stove. She preferred the former and on Saturdays, in preparation for Sunday dinner, there would be pies cooling in their pottery pans out on the back porch that had been baked in the wood-fired stove. The smell was heavenly. That evening in the funeral home I realized I would never again enjoy her cooking. There’s something sad about that, but not completely. For you see, when we remember, we shouldn’t only be caught up in the past. We should remember, as the preacher proclaimed the next day at the funeral, that our lives are in God’s hand and that we know the future will be bright. The type of memory the women had at the tomb was one based on nostalgia. That’s the type of memory Adam probably had when he recalled Paradise and the Garden of Eden after his expulsion. Nostalgic memory makes us sad. We can’t go back. The type of memory the women experienced at the grave was different. It was remembering things to come. They recalled Jesus’ promises of the future, and although we didn’t know what would happen next, they were reassured of Jesus’ continued presence. Easter is a time of remembering. Yes, there is a lot of trouble in this world. We’ve witnessed another terror attack this week, we’ve buried good friends this month, perhaps you’ve heard the news of another friend who is sick. Despite it all, and Easter doesn’t deny the heart-aches we experience, Easter is a time to remember that in Jesus Christ, death and evil have been defeated. Let’s look at our text. Luke begins this day early in the morning. It’s dark. The evening before, after the sun had set which signified the end of the Sabbath, the women gathered spices which were to be used to prepare Jesus’ body for the grave. They wait until early the next morning to finish this task. It’s the right thing to do. There’s a death and something needs to be done with the body and in their culture this includes washing it and putting on spices to cover the odor before wrapping it up and placing it into this final place. But, we’re told in the third verse, there’s no body. This perplexed them. Having no body doesn’t mean Jesus had risen from the dead. After all, someone could have stolen it. Perhaps they wanted a body to cut up in order to learn the secrets of how it’s knitted together. After all, there were not medical text books back then. So stealing the body wasn’t out of the question, but before the women could comprehend that, they encounter angels, heavenly messengers. As the angels informed the shepherds of Jesus’ birth, now they tell of his resurrection. They recap what’s happened over the past few days, things that Jesus had already told them would happen. He’d be handed over to the authorities, would be crucified, would die and then on the third day would rise. Before the cross, this made no sense. Now they remember! Leaving the tomb, forgetting all about the spices, they find the eleven remaining disciples and tell them. But the disciples don’t believe. “It must be an idle tale,” they think. I don’t think it’s because the witnesses are women that the disciples dismiss their story—they wouldn’t have believed anyone. They’d seen people die on the cross. You don’t survive such an experience; you’re a lot worse for the wear. But Peter isn’t so sure. Peter, the rock upon whom Jesus will build his church, runs to the tomb and he, like the women, is amazed. I am sure Peter remembered a lot that morning, at the moment he stuck his head into the tomb. He remember not only Christ’s words and promises, but also his own failing having denied his Lord three times the night before the crucifixion. Yet, such failing is quickly forgotten when one considers the hope that has come through the empty tomb. Such failings are washed away with Jesus’ blood. And now Jesus is back, as Peter will later experience. As Paul wrote to the Corinthians, “Where, O death, is your victory? Where, O death, is your sting?” Paul goes on to say, we have victory over death through our Lord Jesus Christ. What does all this mean to us? The gospel, the good news, is that we worship a God who has control over life and death, a God who has the world in his hands. Yes, we are waiting for the kingdom to be fully realized, but we know it’s coming. We don’t have to worry for we are forgiven and freed from guilt and sin. We’re not to worry for we are freed to live eternally, with Christ. Georgia’s own, Ferrol Sams, a physician turned author, has a short story about the agape love between himself, a Georgian family physician, and a neurologist from Lebanon who worked at Emory. The story takes the form of a letter to the man’s children. He tells about a trip their father took them on, in the 80s, to Lebanon so that their grandfather could meet and hold his grandchildren. Sams had tried to talk his friend out of the journey, saying that his “Carolina wife” and kids would not be safe. At the time the country was torn apart in a terrible Civil War. But he insisted on going. Sams then tells the man’s children in this letter that he frequently prayed during those three weeks, but that he did not worry. Attempting to impart his faith on these children, he went on to add, “I prayed but I did not worry, since there is absolutely no logic of a Christian doing both.” He remembered! And how about you? Do you remember? When you are deep in trouble, do you remember? When someone disappoints you, do you remember? When your friends betray you, do you remember? When it seems your body is falling apart, do you remember? When your dreams die, do you remember? When the world is crashing in all around us and threatening to overwhelm us, do you remember? Do we remember? “The Lord is my shepherd, I shalt not want… Yea, though I walk through the valley of the shadow of death, I will fear no evil: for thou art with me. Remember and believe. Remember and trust the Lord. Amen. Inspiration from this thought came from a line used by Wendell Berry in Remembering: A Novel (San Francisco: North Point Press, 1988), 24. Fred B. Craddock, Luke: Interpretation: A Bible Commentary for Teaching and Preaching (Louisville: John Knox Press, 1990), 283. Ferrol Sams, The Widow’s Mite and Other Stories (New York: Penguin, 1987), 121. Psalm 23 is attributed to David.